Snippets of Jack: "The Only Rules"
"The only rules that really matter are these: what a man can do and what a man can’t do. For instance, you can accept that your father was a pirate and a good man or you can’t. But pirate is in your blood, boy, so you’ll have to square with that some day. And me, for example, I can let you drown, but I can’t bring this ship into Tortuga all by me onesies, savvy? So, can you sail under the command of a pirate, or can you not?" 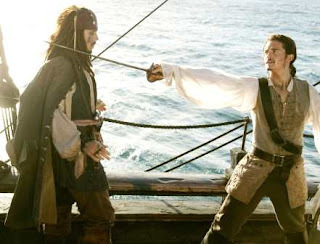 Jack says to Will in The Pirates of the Caribbean: Curse of the Black Pearl. Jack delivers this speech as Will hangs on for his dear life to part of the ship. Will is unable to believe that his father was a pirate. Well, he was, and he was a pretty famous pirate too. BOOTSTRAP BILL! Anyways, Jack might be onto something when he says this. Pirates can be good people (like Will and Jack). Pirate is in Will's blood (already explained). Jack can let Will drown, all though I think Will's attractiveness will be greatly missed as it was in the previous movie. However, Jack probably could have brought the ship to Tortuga all by his "oneies". (Jack must have been being humble for once, but we all know that a crazy pirate like Jack could do it on his own). And alas, we must answer his question "Can you sail under the command of a pirate or can you not?" Well, if you ask me its rather clear that Will can, hence all Jack and Will's great adventures together. What would you give to sail on Jack's ship as a crew mate? Who wouldn't want this insane pirate as their captain?